BASF today announced that it has honored six U.S. builders for their exceptional achievements in high- performance building at the Third Annual BASF Builders Challenge Awards. The ceremony was held during the 2011 International Builders Show in Orlando, Florida on January 13, 2011. The award program exemplifies BASF’s long-term objective and commitment to...reducing our collective environmental impact. BASF today announced that it has honored six U.S. builders for their exceptional achievements in high- performance building at the Third Annual BASF Builders Challenge Awards. The ceremony was held during the 2011 International Builders Show in Orlando, Florida on January 13 2011. 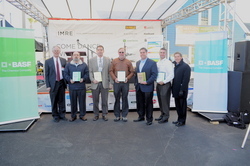 The awards were presented by BASF on behalf of the U.S. Department of Energy (DOE) to builders who have achieved superior performance through DOE’s Building America Builders Challenge program. Award recipients include David Weekley Homes (Texas) for qualifying the most homes (779) for the Builders Challenge in 2010, Artistic Homes (New Mexico), GW Robinson Homes (Florida), KB Homes (Florida), LifeStyle Homes (Florida), and Tommy Williams Homes (Florida) for qualifying homes to Maximized Energy Performance, i.e., homes that produce as much energy as they use, through the Builders Challenge in 2010. The DOE Building America Builders Challenge initiative is helping to change the face of home energy efficiency by recognizing high-performance homes with the EnergySmart Home Scale™. To qualify, homes must use at least 30 percent less energy than a typical new home built to code, and they must meet Builders Challenge Quality Criteria to ensure the highest level of comfort and quality. Building America research and third-party verifiers ensure that the best whole-house energy solutions developed in the laboratory are translated and installed properly in the field. To date, the Builders Challenge has more than 1,200 partners and more than half are builders. Energy efficiency comes first with 196 builders who qualified almost 5,240 homes in 39 states. These builders are saving their customers nearly $5 million per year. The Builders Challenge Awards were established in 2009 by BASF to pay tribute to builders for achieving significant benchmarks under the DOE program. The 2010 Builders Challenge Award winners were included in two categories: Most homes qualified and Maximized Energy Performance homes. David Weekley Homes, Houston, Texas, qualified 779 homes with average HERS scores from 59 – 68. David Weekley’s Houston division has qualified more than 1,100 homes since signing on a Builders Challenge partner in December 2008. Building Science Corporation recently calculated that David Weekley homeowners save an average of $1,200 annually on their utility bills. Artistic Homes, Albuquerque, New Mexico, One Maximized Energy Performance home. In 2008, Artistic Homes of Albuquerque, New Mexico, became the first production home builder in the United States to offer a true net zero energy upgrade option on all its homes. In 2010, 45 percent of its homes were built to near to or true zero energy and a standard Artistic home averages a low HERS score of 51. GW Robinson Homes, Gainesville, Florida, One Maximized Energy Performance home. In 2010, GW Robinson hit a milestone in its 10-year partnership with DOE’s Building America program by building a true net zero energy home. The production builder routinely achieves HERS scores of less than 60 on all of its “green smart” homes. KB Homes, Orlando, Florida, One Maximized Energy Performance home. KB Homes built “An Idea Home Created with Martha Stewart” that scores a 0 on the HERS score. KB was recently ranked number one Green Homebuilder by Calvert Investments. LifeStyle Homes, Melbourne, Florida, One Maximized Energy Performance home. LifeStyle partnered with the Florida Solar Energy Center to achieve a true zero energy home and another is in the works. In two years, LifeStyle Homes has rapidly progressed from code-minimum homes to homes with HERS scores of 60 or less. Tommy Williams Homes, Gainesville, Florida, Two Maximized Energy Performance homes. A DOE Building America partner since 2004, Tommy Williams Homes built not just one, but two true zero energy homes in 2010. More information about the Builders Challenge program is available at http://www.buildingamerica.gov/challenge. Learn more about BASF’s sustainable construction solutions at http://www.construction.basf.us. BASF - The Chemical Company. BASF Corporation, headquartered in Florham Park, New Jersey, is the North American affiliate of BASF SE, Ludwigshafen, Germany. BASF has approximately 16,000 employees in North America, and had sales of $13 billion in 2009. For more information about BASF’s North American operations, or to sign up to receive news releases by e-mail, visit http://www.basf.us. BASF is the world’s leading chemical company: The Chemical Company. Its portfolio ranges from chemicals, plastics and performance products to agricultural products, fine chemicals and oil and gas. As a reliable partner, BASF creates chemistry to help its customers in virtually all industries to be more successful. With its high-value products and intelligent solutions, BASF plays an important role in finding answers to global challenges, such as climate protection, energy efficiency, nutrition and mobility. BASF posted sales of more than €50 billion in 2009 and had approximately 105,000 employees as of the end of the year. Further information on BASF is available on the Internet at http://www.basf.com.